Perhaps it's the colors- vibrant sea foam green, dark cherry wood, coquettish robins egg blue and sharp accents of gold. Or the aroma, frankincense, welting max. There is a warmth all around, the energy of tranquility and peace resonate from within. 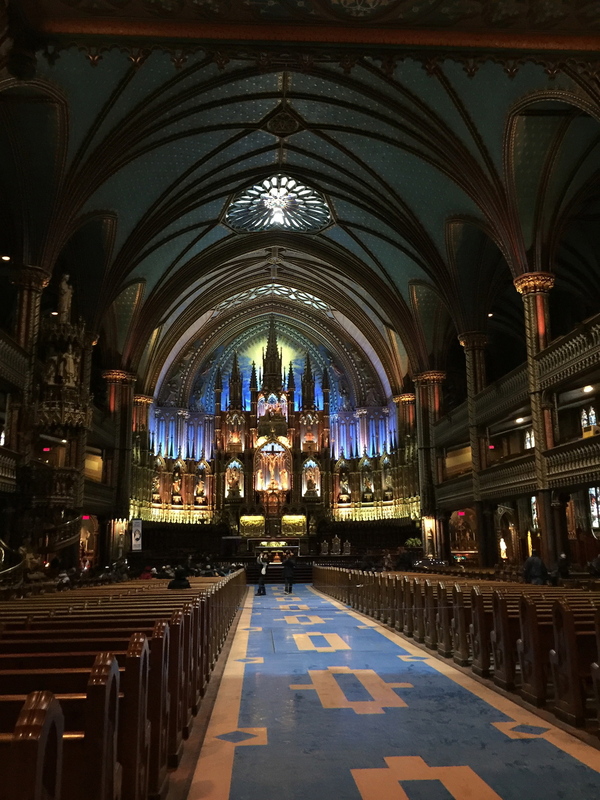 Whatever it is, Montreal's famed Notre-Dame Basilica is a true refuge and a work of astounding beauty. 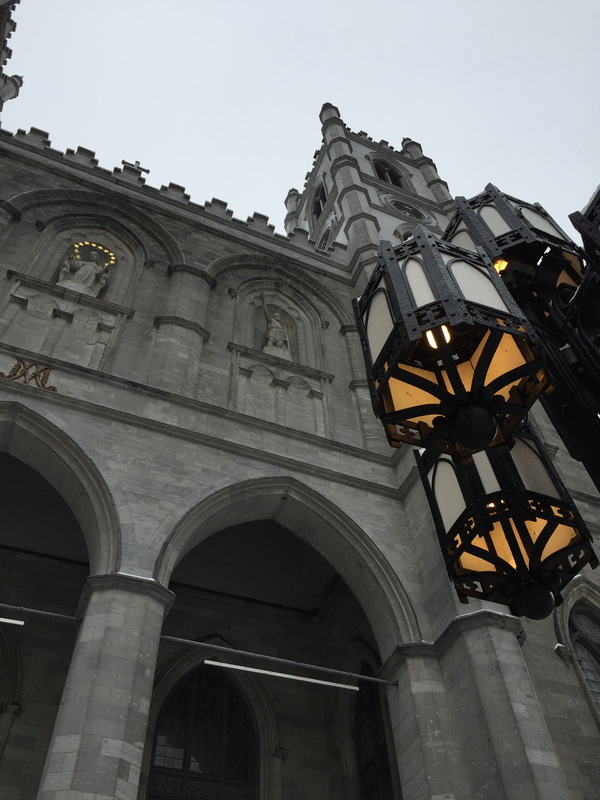 Built in 1824, the Notre-Dame Basilica is easily one of the most impressive structures in the historic district of Old Montreal. Known in a more modern context as the place where Celine Dion got married, the Notre-Dame Basilica is home to a large collection of priceless religious art and archaeological finds. Visited by Pope John Paul II, the Notre-Dame Basilica has been host to many prominent historical events and in 1989 was assigned the designation as a National Historic Site of Canada. Despite the pomp and circumstance surrounding the Basilica, it runs as an active church. For the people, the Basilica offers a full host of religious services from mass to marriage, baptisms and funerals. A site frequented by religious pilgrims, the Basilica is also open, for a nominal fee, to tourists. I find during my travels that there are few things, more grounding and calming than visiting religious sites. I've visited mosques and temples, basilicas and shrines, each one, regardless of the religion it was attached to, resonated that special energy that comes from being in the presence of the "Divine." 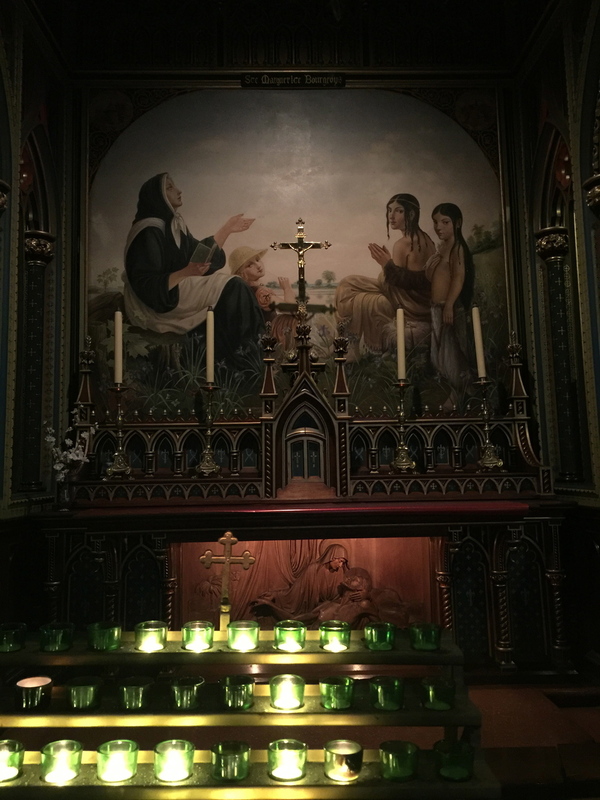 The Basilica is not just for Catholics or Christians. 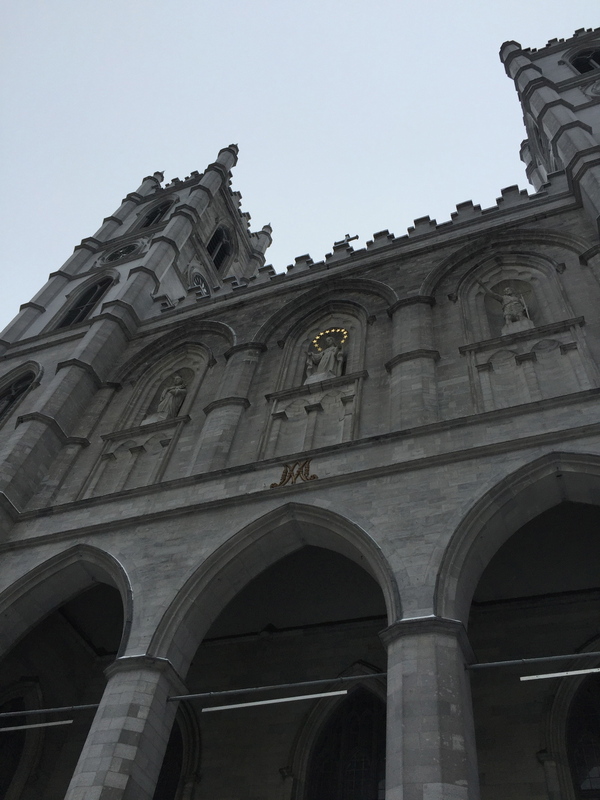 Located in the heart of Old Montreal, the Notre-Dame Basilica is within easy walking distance of the water, restaurants and shops. 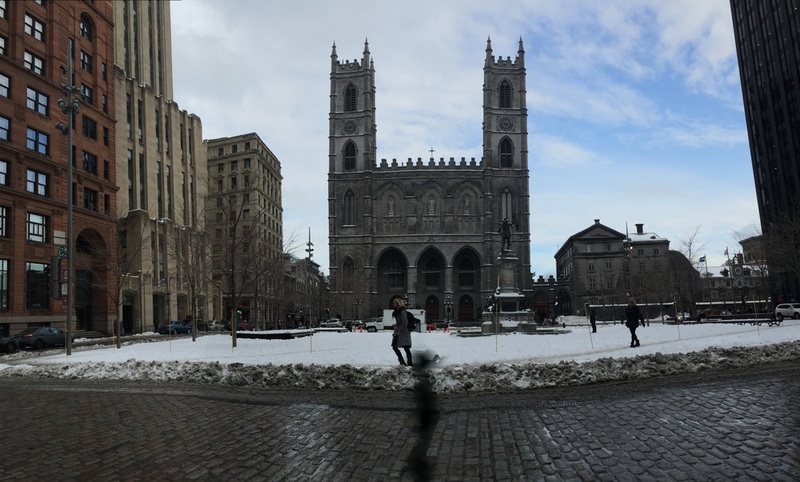 The cobblestone streets of Old Montreal are historic and unique. There's so much to do in the neighborhood, which feels like a suburb of Paris. 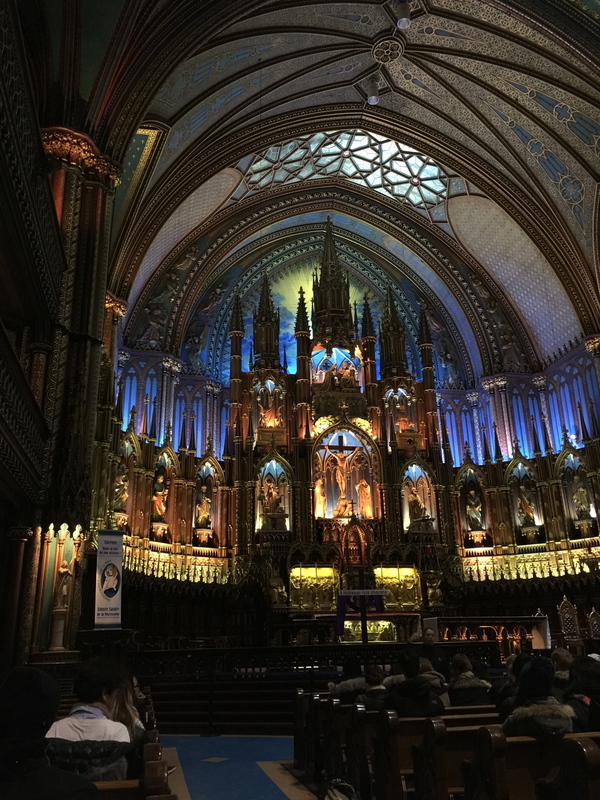 I still don't know if it's the colors, or the aroma, the stained glass, the velvety seats, but I am called again and again to the Notre-Dame Basilica. This wasn't my first visit and I'm sure it won't be my last. 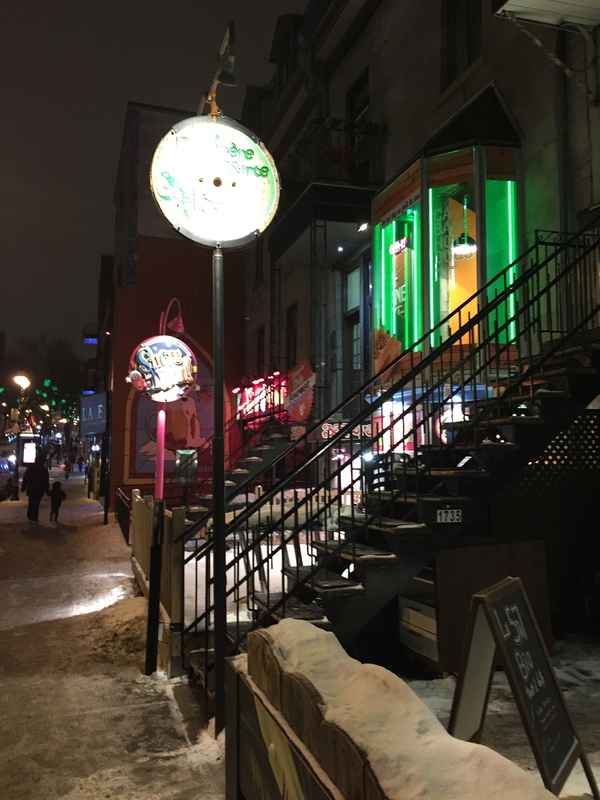 Montreal, is one of the most charming and unique cities in North America! 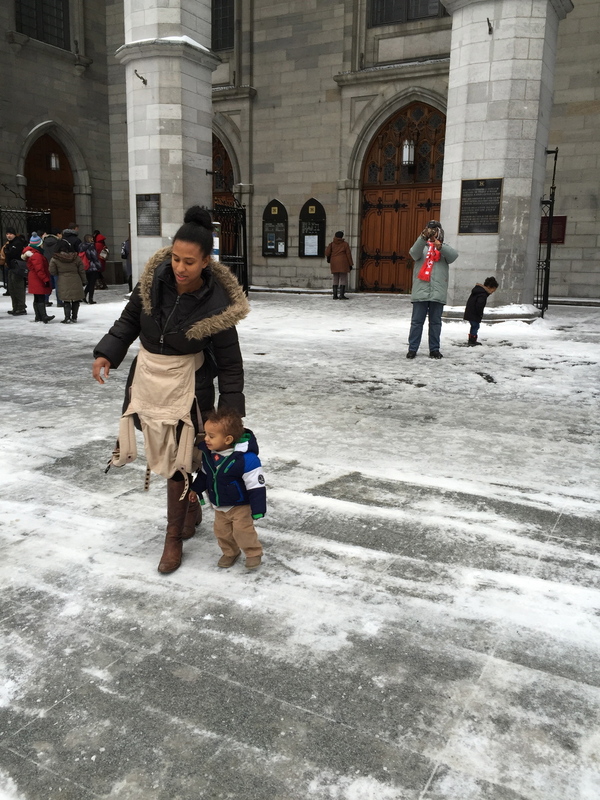 In the heart of downtown Montreal, the Notre-Dame Basilica is a beautiful haven of peace. Modeled after Notre-Dame in Paris, the Basilica is an ornate wonder. 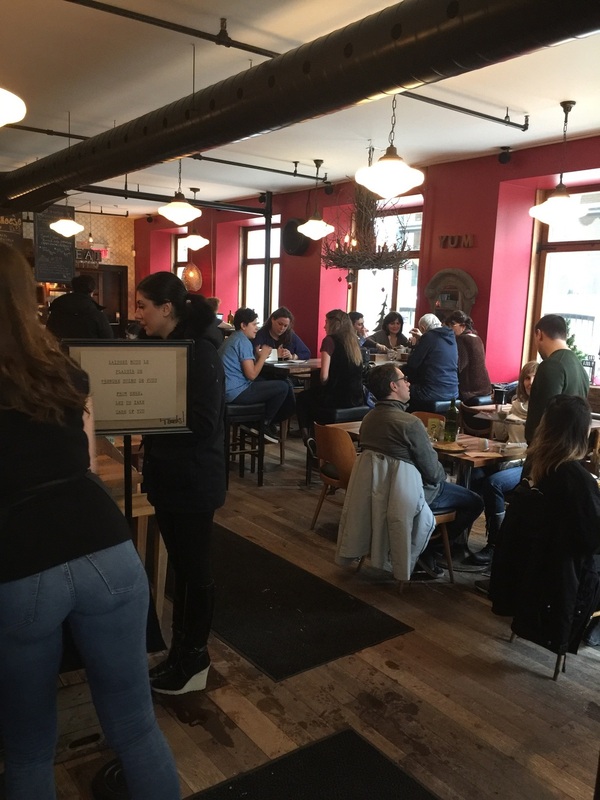 The energy inside was very positive. I love the overwhelming sense of peace that strikes while inside a holy place. Lynne and I opted to guide ourselves, but tours are also available for a small price. Don't forget to light a candle or two before you leave. In the mood to shop. 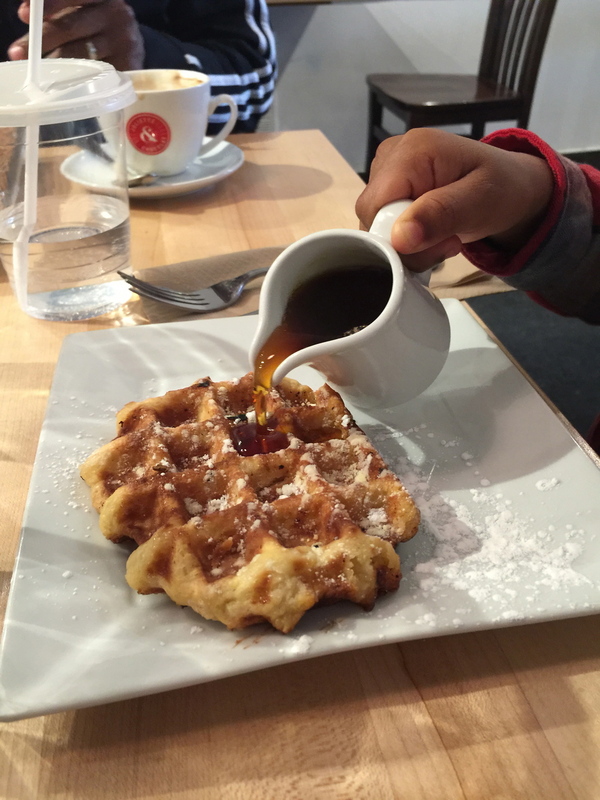 Take a day trip via highway 15, up North to St. Sauveur in the Laurentians. You'll find a cozy ski resort town full of quaint local shops. 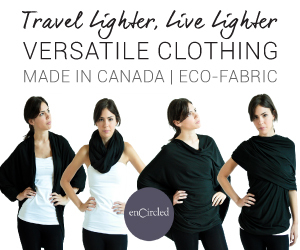 Montreal has a unique fashion scene. Clothes, unlike the gray, frozen landscape, are brightly colored and full of texture. I was in winter sweater heaven. 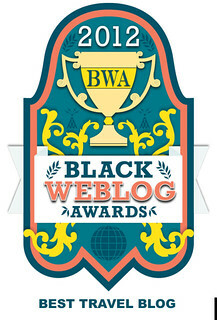 And a bit of good news. 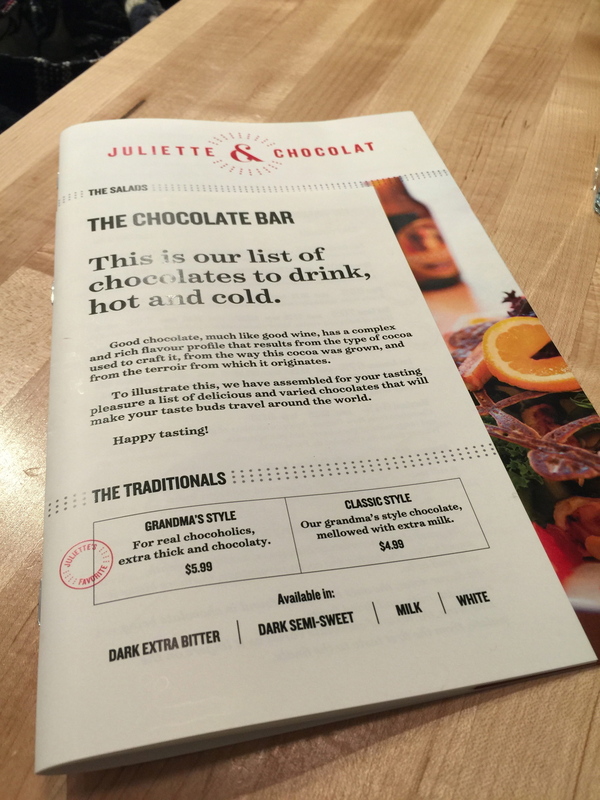 The American dollar converts in our favor in Canada (for now ; ) ). The Jean-Talon Market is the great central market of Montreal. Impressive in the winter, I was told it is even more impressive in the summer when scores of people congregate outside and in to browse the food stands. Be prepared to have your nostrils assaulted by the alluring sweet and savory aromas of French food. Fresh crepes, they’ve got them, fromage (cheese), mais oui, and in an assortment of varieties. Fresh flowers, bread, meat and fish, are also sold out of neat little stalls and mini-shops. Everything is locally produced and tantalizingly fresh. I walked away with a jar of lavender/violet preserves and a jug of rum infused maple syrup. I love charming little touches. Also present were several cider vendors. The cider is a local favorite. Mild in alcoholic content, it is used to wash down a good meal, a digestive of sorts I have been told. Vendors are more than happy to provide you with samples if you request one. I'm not going to lie, I'm actually not a fan of cider, it was too reminiscent of beer for my tastes (I am a die-hard wino). Anyhow, if you want to get into the mix and get a sense of local culture, the Jean-Talon market in downtown Montreal is a must-do! When you visit Montreal, and if you are doing it correctly, prepare to put on pounds. I’m really not sure how the local population stays so thin (one of the secrets of the French I can only imagine). Local food is a rich delight. I didn’t have a single bad meal. Well, I had one, but that’s another story for another post involving a very stubborn and bland fish called Monsieur Lionelle Rouge. One of my favorite local delicacies was poutine, a fattening bowl of crispy fried potato wedges, large chunks of fresh curdled cheese and a savory gravy sauce. Poutine, I learned, comes in many varieties (such as - with chicken, with pasta sauce, etc.). I opted for the tried and true original. The portions that I saw were large. Be warned, you may not be able to move afterwards, you may have a heart attack, but it is so, so, good. And at the end of the day, doesn’t that make it worth it? I headed to Montreal to see Lynne. Lynne of Mozambique fame (reference entries way way down....no...keep going...there you go). It has been over a year since I said farewell to Lynne near the dusty Mercado Central in Inhambane and over a decade since I've last set foot in Montreal (I used to go every February in high school with the French teacher). My main objective during this trip - catch-up with Lynne of course and EAT EAT EAT!